The drop in temperature has really got me longing for the lazy summer days that passed us by only a few short weeks ago. This got me thinking about places my family and I could go where we could kick back and soak up the sun for a few days. I spoke with my sister who had vacationed in the Caribbean and asked her which countries she enjoyed visiting. One of her favourite countries she wants to go back to visit is The Bahamas. She really fell in love with Bimini, a gorgeous and historical island of The Bahamas only 50 miles away from South Florida. After researching, I came up with a bucket list of some of the attractions and activities my family and I would love to do and explore while vacationing in Bimini. My other half is a huge angler, so we would have to try fishing while visiting Bimini. We would love to fish on the shoreline, and rent a boat to try our hand at fishing on the ocean offshore. I am a history buff, so visiting the Martin Luther King Jr. Memorial is a stop my family must make while visiting Bimini. The memorial at the Bimini Craft Centre in Alice Town honours this great man who had visited Bimini in 1968. He wrote part of his Nobel Peace Prize winning speech and significantly impacted the people during his time on the island. Islands in the Stream was partly influenced by Ernest Hemingway’s time on this island, and Bimini was known as his summer home. It would be great to see where he would go to kick back, relax and to visit some of his favourite haunts while staying on the island. What is a trip to The Bahamas without some leisure time on one of the beaches? Bimini boasts of miles of pristine beaches along its coastline. My family would love to sink their feet and play in their white sandy beaches, or do one of the numerous activities available in the beautiful blue ocean. We love taking in the great outdoors, so we would love to take in the Bimini Nature Trail to learn more about the fauna and flora of the island. It would be so amazing to see the endangered Bimini Boa and find out why it is so important to Bimini. 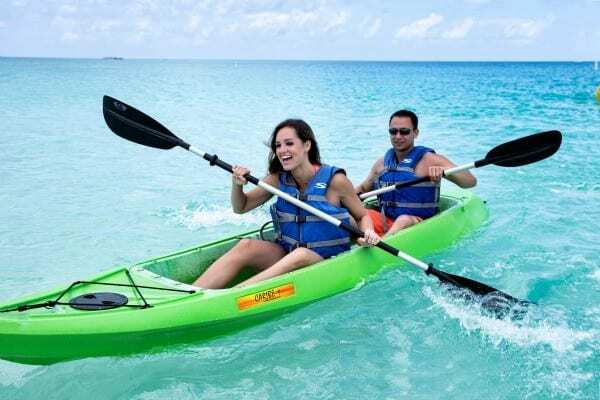 Man and woman in a Kayak. I am always intrigued by special places around the world that are supposed to change your state of being by visiting them. Bimini boasts of The Healing Hole in the mangroves of Bonefish Creek. The Healing hole is a natural fresh-water spring that pumps lithium and sulphur inside a salt water swamp that is only accessible by boat. It is said to have healing properties by those that swim in its waters. I would love to visit this spot to see if the reports are true. Woman sitting on a boat. Another great reason why The Bahamas is an excellent choice for our family to visit is its proximity. There are plenty of non-stop flights available to Nassau, Grand Bahama Island and Exuma from many Canadian cities. Many of these flights are only 3 hours away from Toronto! There are also easy, same-day connections to many of the other Bahamian islands from Nassau, so visiting any of the islands in The Bahamas would be ideal for vacationing. If you are already thinking about escaping winter this year, like I am, consider visiting The Bahamas. You can discover everything the beautiful and inviting islands of The Bahamas has to offer visitors by clicking here to start planning your winter getaway today. You can also share your thoughts about this gorgeous destination by following #ItsBetterInTheBahamas on Twitter. Disclaimer: Although this post has been generously sponsored by The Bahamas Ministry of Tourism, the opinions and language are my own. I’ve always wanted to visit the Bahama Islands but have never got that far, it does look beautiful. I would love to go there and do some Fishing !! It is -22 for me this morning, I am dreaming of the Bahamas!